As a kid, Antonio Acuña was fascinated by rockets, fighter jets and spaceships. He dreamed of exploring space, making discoveries and someday even setting foot on Mars. 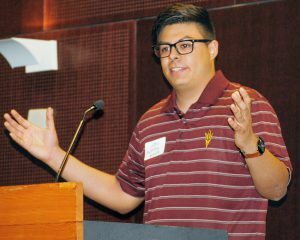 By the time he was a student at Westwood High School in Mesa, he had made up his mind he wanted to study aerospace engineering, but he wasn’t sure how he would get to college or how he would pay for it. The first in his family to consider pursuing higher education, Antonio knew his parents would be unable to help him financially or advise him about scholarships. He applied for federal student aid and discovered it would cover only about a third of his tuition. He had a job at an after-school program for children, but no savings. “I couldn’t keep track of my money,” Antonio says. Enrolling in Earn to Learn as a senior in high school showed Antonio that saving and financing his college experience wasn’t, well, rocket science. Today, Antonio is a junior at Arizona State University studying aerospace engineering and astronomy. He continues to work and save each month, and with the help of a few other academic grants he secured, is on track to graduate with no student debt. After graduation, he wants to get a job, save more money, and pursue a graduate degree.